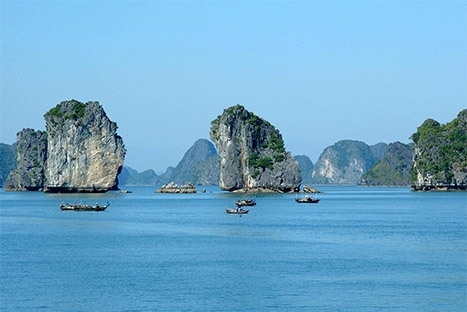 The unrivalled beauty of Hanoi and Halong Bay are explored in this luxurious tour of Vietnam. This tour incorporates two of the better known destinations in Vietnam, Hanoi with its many grandiose villa and imperial palaces dating back to the Colonial era. Not to mention its old quarter that has been a shopper's paradise since the 15th century. Also you will experience some of the finest cuisine in South-East Asia from the very traditional to modern fusion. 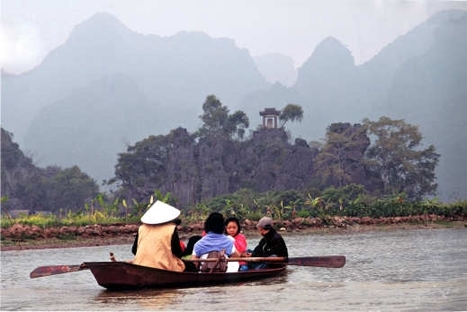 Halong is truly one of the wonders of the world with it many islands to be enjoyed via private traditional junk that, discover this magical place at your own pace. 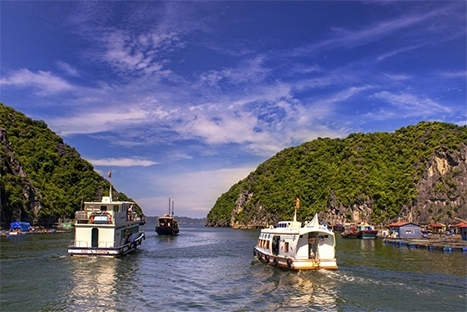 The unrivalled beauty of Hanoi and Halong Bay are explored in this luxurious tour of Vietnam. 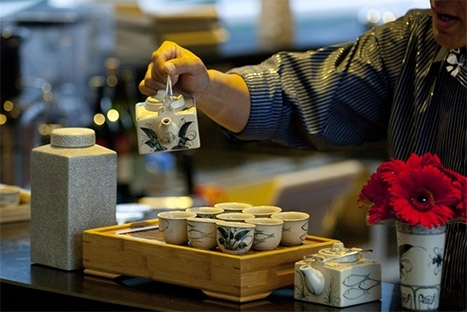 Uncover the intriguing blend of east and western influenced architecture in Hanoi as you relax with fresh coffee at one of the quaint cafes before exploring the vibrant local art scene where a number of galleries await your visit. Unwind in the evenings with a spa session followed by a traditional Vietnamese dinner in one of the cities most charming restaurants. Stay overnight in Hanoi at the luxury designed Sofitel Legend Metropole, a spectacular residence with every need catered to. Receive an insider's walking tour of the Long Bien Bridge which was built in 1902 by Sir Gustave Eiffel and helped shape the future of Hanoi as you continue on your tour of Vietnam. From Long Bien guests are driven to the capital's Old Quarter, an area of bustling narrow streets and alleyways that are home to literally thousands of small businesses and shopkeepers. This is the true heart of Hanoi, and one of the original ancient capitals of Southeast Asia. Be sure to take your camera for some fantastic photo opportunities. Dinner on your final day in Hanoi is served at one of the cities finest eateries, Madame Hien, which serves authentic Vietnamese cuisine in a traditional villa setting. Spend your last 2 days in the dramatic setting of Halong Bay, with over 3,000 islets to cruise amongst. Your final night of this tour in Vietnam is spent aboard a luxury cruise vessel the takes guests through the many spectacular rock formations. Enjoy lunch aboard the boat and watch as the sun drops behind the shimmering sea. Vietnam's capital city of wide tree lined boulevards with its tranquil lakes and colonial villas has a more sedate pace than the frantic pace of Saigon. The capital has many cultural and historic sites which include the grand and solemn mausoleum of Ho Chi Minh, The beautiful temple of literature compound and One Pillar Pagoda founded in 1049. This is a city that offers something for everyone. On arrival at Hanoi's Noi Bai Airport, you will enter the country through the VIP immigration lounge. An Exotissimo guide will greet you and transfer you via classic Citroen to the legendary Sofitel Metropole Hotel. Standing proud as one of the most storied and opulent of Vietnamese hotels, the Metropole has played host to many celebrities and dignitaries, including Charlie Chaplin. Lunch will be served at Wild Lotus Restaurant, at the restored art decor villa that serves fine contemporary Vietnamese cuisine, an experience not to be missed whilst visiting the city. After lunch the discovery starts with a trip through Hanoi's Old Quarter via Vietnams signature mode of transport the cyclo . The tour takes you trough the streets whilst also visiting some of the historic sites like The Temple of Literature the first university in Vietnam ,all the time you will be experiencing the sights and smells of the city. Lunch at the Seasons of Hanoi Restaurant one of the finest examples of traditional cuisine in Vietnam set in a restored Colonial villa that keeps its bygone era charm. Any visit would not be complete without a spa treatment that is part of lives of nearly all Vietnamese in one of the cities chic spa that over looks the Hoan Kim Lake. Qt Spa offers the very best of oriental techniques with Western standard of comfort. Halong Bay is one of the wonders of the world with over 1,500 km2 and 3,000 islets. 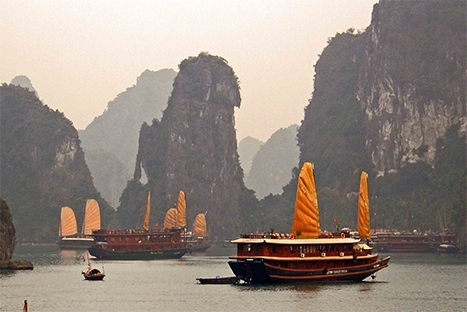 Many tales have been woven about the creation of Halong Bay, or Bay of Descending Dragon. Folk law describes that, the Bay's islands and islets were created when dragons, sent by gods, spat jewels and jade into the area to protect the people of Vietnam from invaders. Cruise through Halong Bay . A private dinner on one of the beaches of the limestone islands that make up Halong Bay. That will leave you with fond memories and breathe taking views. Overnight on board the junk. Breakfast on board your junk . Transfer back to Hanoi for flight out.